Disciples survey several villages" water-supply point. On December 26, 2004, the devastating tsunami resulting from a magnitude 9.0 earthquake in the Indian Ocean off the coast of Indonesia wreaked havoc over much of coastal Asia, with one of the hardest hit areas being the south Indian province of Tamil Nadu. A Tamil-speaking fellow initiate introduces Master to villagers. After having experienced the tsunami, the sufferers need both material aid and spiritual comfort. In response to the disaster, a relief team from the Singapore Center arrived in Chennai, India on December 29. After gathering preliminary information on the situation, the team traveled 330 km south to the fishing community of Nagappatinam, which experienced a severe impact from the tidal wave. Most of the houses near the beach were totally destroyed, and the victims took refuge in schools and other public places such as temples, churches and mosques. Cooked food was supplied at these relief shelters by both governmental and private organizations. While interviewing residents along the road, with the help of the only Tamil-speaking brother on the team, the initiates learned that 150 families living at a remote relief camp 25km away lacked food. And after visiting the camp, the sisters and brothers immediately traveled to a nearby town to purchase bread and cookies, and then distributed the food to the victims late into the night. The next day, the relief team also purchased utensils and more food to distribute to the camp residents, who were very grateful to receive the supplies. As the areas affected by the tsunami spanned a great distance, the initiates decided to split into two teams, with one going farther south and the other moving toward the north. 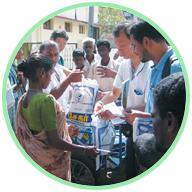 On January 1, 2005, the northern relief team visited an affected site 20km north of Karaikkal city. While surveying the site, representatives of a village containing 42 families approached the initiates for help, and so they quickly purchased the needed food items and utensils at night and distributed them the following day. Then over the next few days, they surveyed a number of villages around Karaikkal and then purchased and distributed food, cooking utensils, personal hygiene items, sleeping mats and blankets to the residents of several villages. 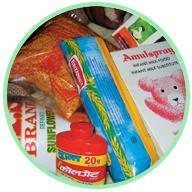 The recipients accepted the supplies with much joy, appreciation and gratitude to Master and Her assistants. During the distribution at one of the remote villages around Karaikkal, the relief team met the local district counselor and several government officials, police and army officers who were there to provide law and order and gather statistics on the situation in the area. These individuals welcomed the team's relief efforts and also expressed gratitude for Master's love shown in such a helpful way. The initiates also distributed writing materials to residents of two villages, where the children were extremely happy and thankful to Master for Her gifts. The relief team also provided aid to Muslim families affected by the disaster in the historic port town of Tranquebar. Meanwhile the southern relief team traveled approximately 300 km to the Kanniyakumari district in the southern-most part of Tamil Nadu State. There fifteen villages had been affected by the tsunami. 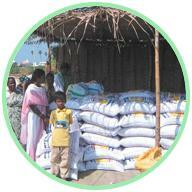 In the village of Kadiapattanam, 1800 families lacked adequate food, having only five kilograms of rice per family. After assessing the residents" needs, the relief team supplied each family with 10kg of rice, 5kg of dal (beans), and 1kg of tomatoes and eggplants each. In another village, Periavilia, the school children needed items such as stationery and material for school uniforms, which the initiates promptly purchased and distributed. While the victims" basic food needs and water supply were being taken care of by the government and private organizations in most of the villages, the nutritional requirements of the infants and children were being neglected. So the relief team bought milk powder, milk bottles and nutritional beverages to distribute to families that required these items in the villages of Periavilai, Channavilai, Manukari and Colachel. The parish priest of one of the local churches remarked that The Supreme Master Ching Hai International Association was the first group to have delivered these food items to the children. The villagers were happy to receive the relief supplies together with leaflets explaining Master's teachings and were very thankful for Master's love and care. Children line up in an orderly fashion and await the distribution of relief items. A local pastor discusses Master and Her contributions with tsunami victims. A pastor and volunteers from a village help to arrange items for distribution. Immediately after the 2004 Indian Ocean Tsunami struck, fellow practitioners from The Supreme Master Ching Hai International Association arrived in the affected regions in South Asia and East Africa to render relief and convey Master's love to the victims. For reports on this work, please tune in to our Internet TV program A Journey Through Aesthetic Realms Nos. 124, 125 and 126 on the CTiTV Entertainment Channel.